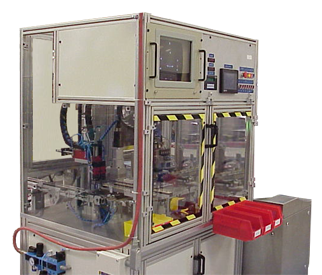 The testing machines supplied and integrated on two ISO-Mini SPDT Relay production lines were built to mark, inspect, and sort rejects at 30 cycles per minute. 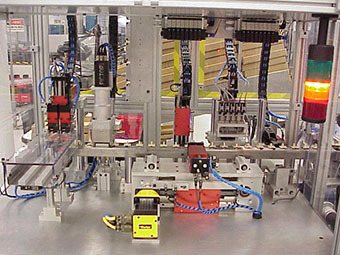 Fully automatic, each machine required minimal operator support. 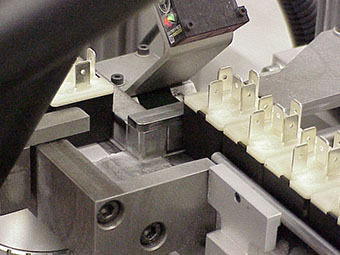 Operators were needed only for routine setup and PM, as well as the occasional clearing of reject bins. 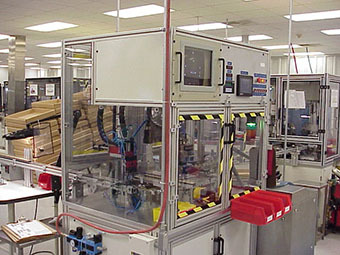 During normal operation, the relays were singulated from an in-feed conveyor, laser-printed, and then indexed through a series of inspection stations by a combination servo-pneumatic walking beam. 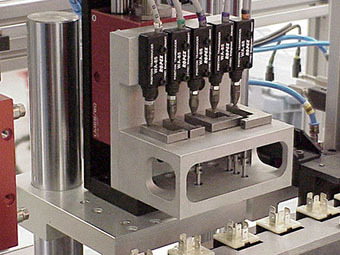 The available inspection stations included several electrical checks, non-contact measurement of relay terminal positions, and verification of the laser-print ID, and together they provided a complete electrical and mechanical quality validation. At the end of the walking beam the inspected relays were released to an out-feed conveyor, and any identified rejects were quarantined and sorted by failure mode.